Blaze Destroys Mobile Home in Frostburg. A flaming house trailer in Frostburg claimed the lives of three persons today, including two young children who died shortly before noon in Minors Hospital, and a fireman who collapsed and died after helping one of the children from the blazing mobile home. Victims of the tragic accident were Jeffrey Bullers, 2, and Douglas Bullers, his 14-month-old brother, who were rushed to the Minors after being carried from the house trailer. They were the children of Mr. and Mrs. Robert Bowlers. Manager of the meat department at the Acme market in Frostburg, Lamberson went along with the Frostburg Firefighters when the alarm sounded at about 8am today. Scene of the blaze was the Lowery Mozer-Trailer Park, 56 Green St. The older of the two brothers was rescued from the blazing and smoke-filled trailer by Frostburg fireman James McMorran and Lamberson, who collapse as he stepped from the mobile home. Douglas was rescued by Lou Henry, another member of the Frostburg Fire Department. The children were rushed to Minors Hospital in a station wagon operated by police Chief William Goebel. Mouth-to-mouth resuscitation was given in route by Henry, McMorran and Albert Neil. Attaches at Miners reported the younger Bullers in critical condition on arrival, suffering from severe burns of the mouth and throat resulting from inhaling superheated air, and his older brother in “fair to poor” condition. Frostburg Fire Chief, Joseph Durst, Jr. said Mr. and Mrs. Bullers were at work when the fire occurred. Babysitting at the trailer home was Mrs. Charlotte Davis, 18, of 212 Center St., Frostburg. Mrs. Davis was accompanied by a young daughter while attending the Bullers boys and a four-year-old sister, Luann Bullers, who escaped injury in the tragic accident. Mrs. Davis told authorities the oil heater in the trailer began smoking and becoming worried, went to the adjoining trailer that was occupied by her sister, Mrs. Wilder Coleman. Mrs. Davis said she sought advice since the trailers were similar and make them were heated by the same type stoves. Her young daughter about 18 months old, accompanied Davis to the Coleman trailer. She was gone but a very short time, Mrs. Davis said, when she returned to the Bullers trailer to find it enveloped in dense smoke, with flames shooting out the area of the mobile home where the heater was located. The Bullers girl was rescued by Mrs. Davis but she was unable to re-enter because of intense heat. Investigating the accident are Fire Marshall Jesse Jacobs and TFC. Bernard Chabot of the LaVale State Police Detachment. The mobile home was destroyed Jacobs said. In December of 1962, for his efforts in rescuing one of the children, James McMorran was presented the Heroism Award from the Allegany-Garrett County Volunteer Fireman’s Association in the form of an engraved plaque. A posthumous award was presented to the widow of James Lamberson for his actions. Below is an excerpt from the write up that accompanied McMorran’s plaque. On the morning of 31 May 1961, Jim answered an alarm of the Frostburg Fire Department, which is a member and chauffer. Upon reporting to the fire station for driving duty, Jim was informed of the location of the house trailer fire and was also told that children were entrapped. Jim sped to the scene of the fire with an engine, and in order to eliminate any further delay, entered the flaming structure without protective clothing, breathing apparatus or hose line and immediately initiated rescue attempts. 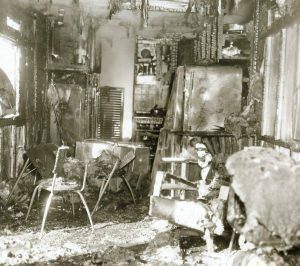 The interior of the house trailer was engulfed in flames and dense smoke, Jim and his fellow fireman that also arrived at the scene of the fire crawled on the floor of the trailer through the flames and smoke in search of the children. One child was located and removed from the flaming structure by the two firemen working as a team. Upon reaching the outside of the flaming trailer, Jim noted that this rescued child was not breathing. He immediately wrapped the child in a bunker coat and initiated mouth-to-mouth resuscitation in an effort to revive the child.